The group to Sgt G E Watkins, KVR, part of a family group in the next DNW auction. George E. Watkins served as a Sergeant in the Diamond Field Horse during the operations in Bechuanaland 1896-97; as Company Sergeant-Major in the Kimberley Volunteer Regiment and Lieutenant in Scott’s Railway Guards during the Boer War and as a Serjeant in the South African Medical Corps during the Great War. K.S.A. not confirmed. There are 45 letters written by the sons to their parents. Original Discharge certificate for Robert Joseph Whitter 28th January 1915. An original envelope for Gunner R.W. Whitter Lewis Gun Section. Original letter from the Department of Defence to Mrs Margaret Whitter informing her of the death of her son 4403 Robert Joseph Whitter. Three other original letters from the Dept of Defence re Pte Robert Joseph Whitter. Three original letters from the South African Gifts and Comforts Organisations Committee. A black and white photograph of the two sons in uniform. There are 18 letters from Family to the sons. There is a two page hand written letter of condolence from Major Jenkins who was wounded when R.J. Whitter was killed. Please note the death plaques have been polished to the point where the names are barely legible. DoK group with a Union of South Africa MSM to Squadron Sergeant-Major F. D. McKinley. One of 46 such awards of the Union of South Africa MSM (Government Gazette 25 August 1922). Frederick David McKinley was born in Pretoria in November 1864 and joined the Cape Police in December 1894. 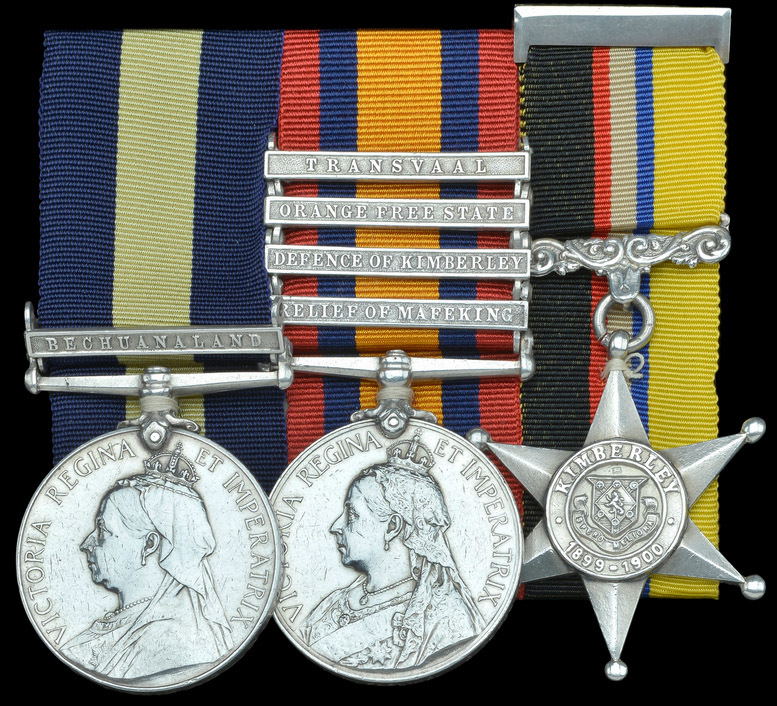 Having then served as a Private in the Bechuanaland operations of 1896-97 (Medal & clasp), he witnessed further action in the Boer War, when he was present as a Corporal - afterwards Sergeant - at the defence of Kimberley and Paardeberg, and in operations in the Transvaal (Queen’s Medal & 3 clasps; King’s Medal & 2 clasps); he married Anna Isabella Silver at St. George’s, Hanover Square, in London in March 1902, aged 37 years. 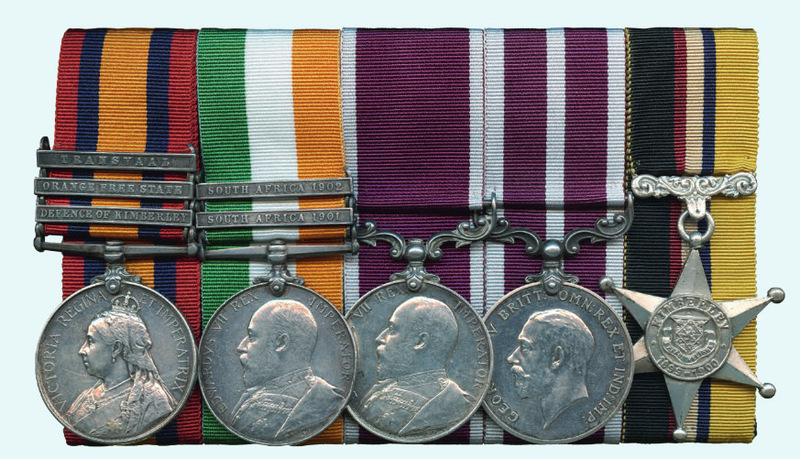 During the Great War he served in German South-West Africa in the 5th South African Mounted Rifles, gaining advancement to Squadron Sergeant-Major prior to taking his discharge in December 1918; his award of the L.S. & G.C. is verified on his official Statement of Service. Lancelot Matthew Fabling is recorded as having taken part in the Jameson Raid in early 1896. He joined the Cape Police in May 1896 and during the DoK served the Police seven-pounder gun which is now mounted on the Cape Police memorial in Kimberley. He died in January 1924 and is buried in Plumstead cemetery, South Africa. 1902 and Home 14 February 1902 to his discharge from the Army on 14 October 1910. Group to Colonel C. De Putron, Lancashire Fusiliers, Late Loyal North Lancashire Regiment and MID for the siege. Lancashire Regiment 1895; Lieutenant 1897; Assistant Signalling Officer and Brigade Transport Officer during the Defence of Kimberley (Mentioned in Despatches 8 May 1900); Captain 2nd Battalion Lancashire Fusiliers 15 June 1901; Instructor School of Musketry (Hythe) 1 April 1909 to 31 March 1913; attached General Staff (graded Brigade Major), Northern Command December 1913 to March 1915, served during the Great War in Gallipoli, March to October 1915, Major 1 September 1915, the Balkans Theatre of Operations, October 1915 to April 1916 and November 1916 to June 1917; Temporary Lieutenant Colonel attached 2/15th Battalion London Regiment, May 1916 to October 1917, Western Front May 1916 to November 1916; with the Egyptian Expeditionary Force June 1917 to May 1918 (mentioned in Despatches London Gazette, 5 November 1915 and 4 January 1917; Legion of Honour 5th Class and Croix de Guerre); Commandant School of Musketry Southern Command August 1918 to March 1919; Lieutenant Colonel 22 March 1920; Colonel 22 March 1924; Officer in Command Record and Pay Office Royal Tank Corps 12 March 1927.